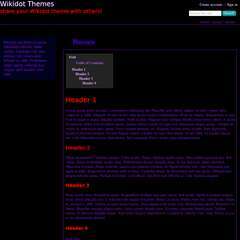 This is the official CSS theme for the Havok Role Playing Group. It's derived from neon by miffysora and functions to provide an easy-on-the-eyes reading experience. Feel free to take it and remix it! I'd love to see what you guys can come up with! As a member of Reverend Fox's primary site, I'm quite happy that he made his theme publically available. It's a dark but clean theme which is very easy to read.